Men and women alike can sometimes be very particular about the style of their blogs. After all, their personal blogs are expression of themselves, of their entirety, and so it makes much sense that people would be very particular about the way it looks. In addition, the way a website looks, is not just an expression of the owner of the blog. It is also important for viewers of the website. For instance, if a website’s main audience are mostly guys, it sometimes follows that the design of the website should be masculine. This is also the same for women. It is important to also follow what appeals to the audience because this is how websites relate to them — through design and, of course, through content. For instance, women would automatically assume that the website is for them if it has feminine features and overtones. This sends the message that the website knows exactly what its audience needs. Generally, it also looks visually appealing to a certain audience, which adds to the value of the website. To satisfy a particular set of audience, developers have created WordPress themes that are feminine and girly. What is good about this is that developers caught a good balance between elegant and beautiful designs and functionality, ensuring that those who prefer to have a feminine and girly theme will still have a powerful website with them. They have a variety of features that will boost your website’s functionality. Majority of these websites are highly customizable, too, so even though you use the same theme as about a hundred others, how you customize it will make it stand out. You can still express and show the other parts of yourself aside from your femininity. These themes are not just powerful either. They are multi-purpose as well, fit for whatever kind of use you have planned for your website. It does not matter if you just want a personal blog, a personal portfolio, your own business website, or any other purpose out there. These feminine and girly WordPress themes are very flexible that, for sure, you will have an easy time working with them. That’s the reason why we’ve done the work for you and created this collection of Best Feminine Girly WordPress Themes of 2017 for women Website, that will inspire you to change the look of pretty website designs. The Mysterious Girl has very feminine touches, but not overbearing. It has a watercolor floral design on what seems to be paper as the background. This theme has a header with navigation links, social links, a search bar, and the menu. Right below it is the website content that starts with the website name. Below the website name is a slider that features sticky posts that the owner might want to highlight. The entire design, aside from the floral images, has a touch of peach, making the theme very girly. This, however, can be customized. Right below the slider is a two-column layout that shows blog entries on the left and widgets on the right. Widgets can be a short description about the owner of the blog, social media links, and maybe other posts. At the footer, you will see a box to sign up for the newsletter as well as an Instagram collage. 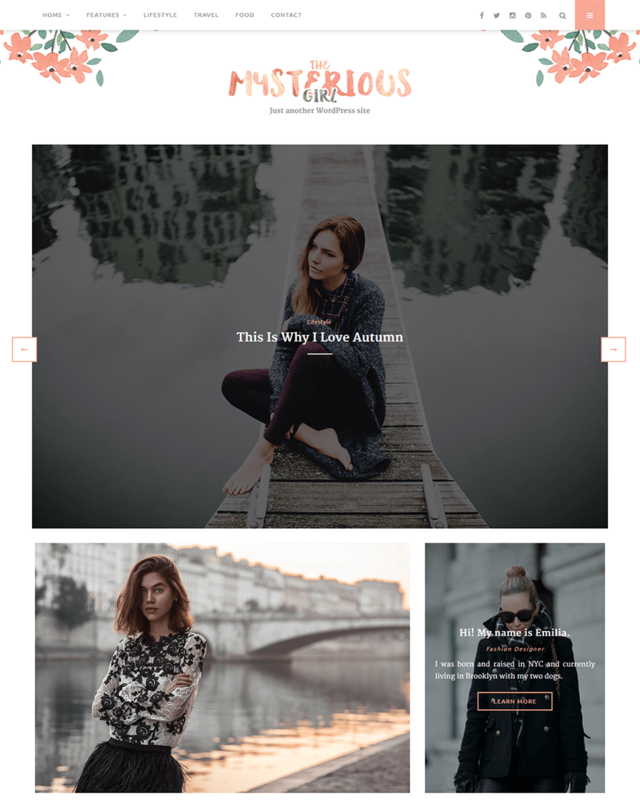 InFashion is an clean and simple WordPress theme designed for fashion blogs. The premium theme designer focus on minimal design, beautifully placed high impact large image in post so content and images always stand out by the post reader. It’s versatile and could be used for personal journal and travel blogs. The theme build on powerful ReduxFramework with a fully responsive and adaptive layout that scales to display nicely on all mobile devices. This theme offers you everything you may need to create a great looking fashion blog site. You can choose typography with lots of selection, Instagram feed and Social media links and sharing buttons, Upload custom logo and favicon, Child theme support. Blogo has a very kiddy design, good for those who like hand-drawn art on their website. This isn’t very specific to the feminine audience, however. Blogo seems to be as neutral as it gets. But it is part of this list because it is highly customizable that it can pass off as a feminine and girly WordPress theme. Aside from the header that has navigation links and social media links, Blogo has a featured post right below the header. Underneath the header, you will find the entire website content that employs a two-column layout. The website content itself features a photo and an excerpt of the post, while the sidebar on the right shows the search bar, recent posts, categories, tags, and many others. Blogo also has a footer that contains widgets. In the demo, you will find the archive, categories, tags, and custom menu at the footer. But once you install Blogo, you can tweak the widgets and put whatever you want to put. 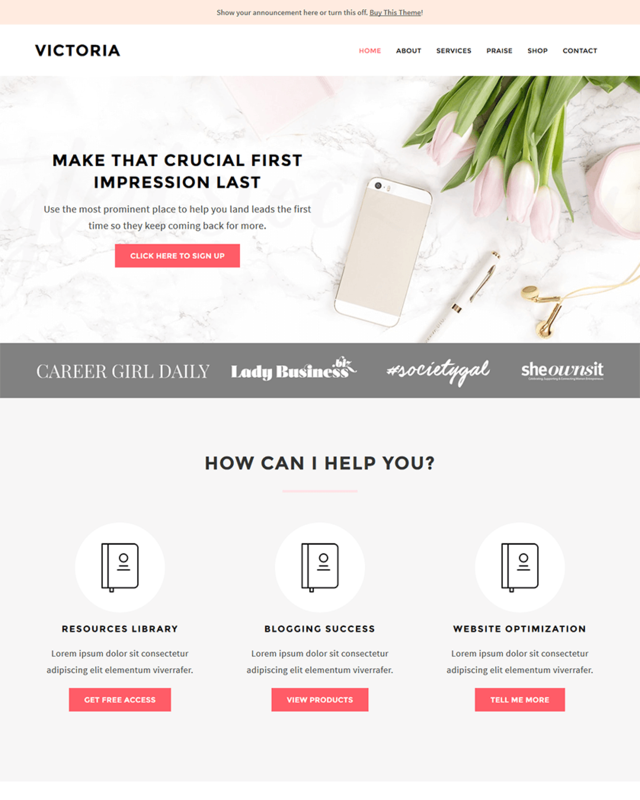 Victoria is a feminine and girly WordPress theme that fits a career woman. Its interface is very professional, and it fits a power woman boss personality. 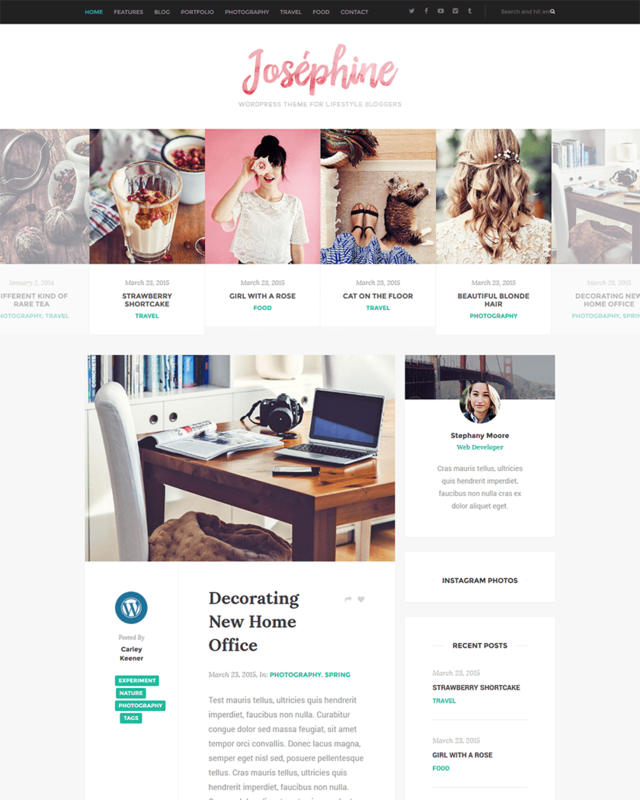 This theme is actually designed for a woman entrepreneur in mind. Victoria is WooCommerce compatible, ensuring you can smoothly sell anything on your website. It also has a newsletter sign up form, opening a line of communication with your visitors, regardless if they are on your site or not. It also reminds your visitors that you have a website they can keep coming back to. Victoria is designed to be SEO-friendly, a big boost for your business since being SEO-friendly means you can be easily searchable. In addition, Victoria developers saw to it that you have a call to action area. This is where you can promote products or even “promote” an action. For instance, if you want them to sign up for your newsletter, you can make the announcement there. This is important for businesses. 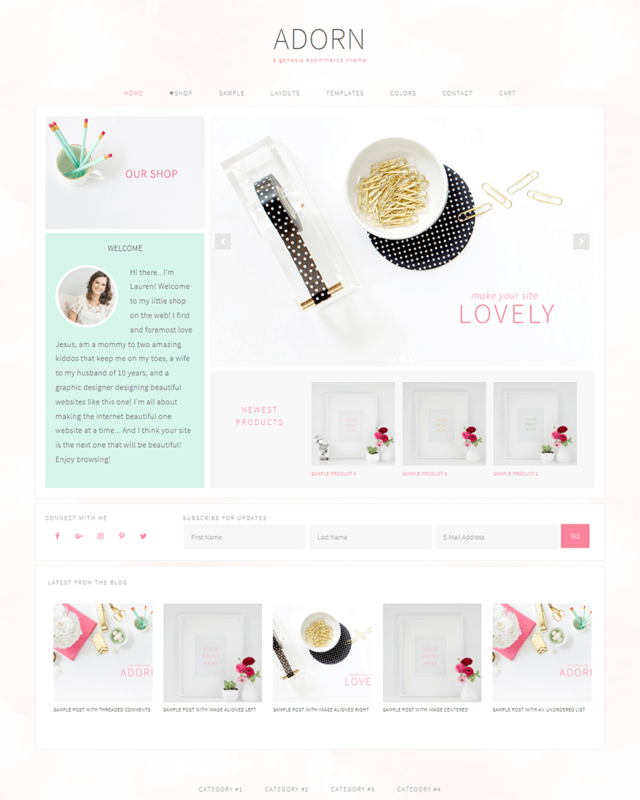 Just like Victoria, Emma is feminine and girly WordPress theme that can be used for businesses. Emma opens up with a divided page. On your left is the website title or the name of your business. Below it could be a short description. You can also input your newsletter sign up in the same area so your short description could be an appeal to your visitors. Social media links can also be found on this area. On the right side of the page is purely a photo. This can be your chance to preview the kinds of products you are planning to sell so make sure that you put photos here that are high resolution and visually appealing. If you are targeting women, make sure that it appeals to their taste. 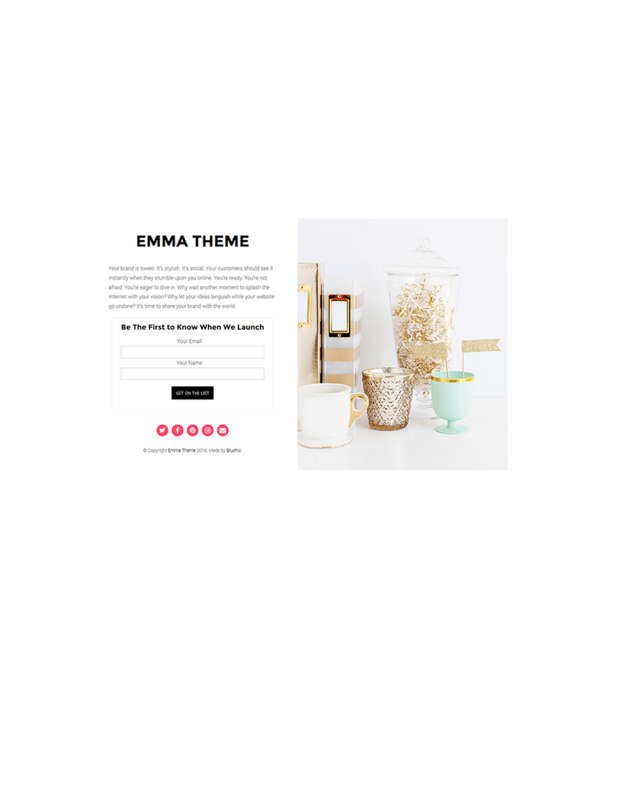 Emma is actually a pretty simple theme with standard WordPress theme features, but its design is beautifully crafted for women. From the same developers of Emma, Marilyn is a feminine and girly WordPress theme that suits a fashion and lifestyle blogger’s needs. Its design is very simple. It is minimalist in the sense that it uses a combination of only three colors: white for the entire background, black for texts, and pink for feminine accents. It opens up with a big website title at the very top and a relatively smaller subtitle. Below it is the two-column layout which contains the website content. It starts with a small slider first. Beside it, on the other column is a sign up for the newsletter. Below would be a portion where the owner of the blog can put a description of what the blog is about. Underneath it, are categories that visitors can click. These are displayed as photos. At the footer, Instagram photos from the Instagram accounts of the owner or the brand can be shown. 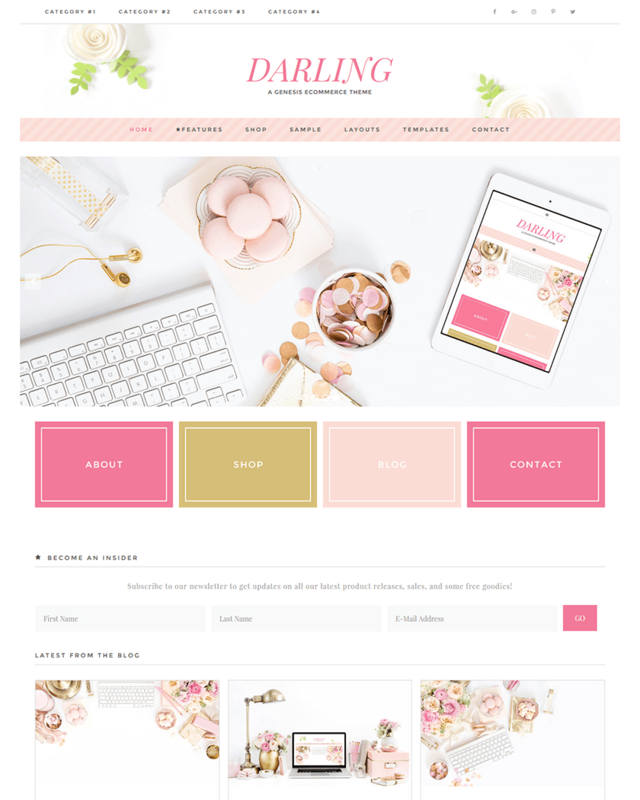 Darling is a very organized feminine and girly WordPress theme that also seems to be designed for e-commerce. It has a thin header at the very top of the page when you open a website using a Darling theme. In this header, you can put categories and your social media links. Right underneath the header is the website title and a small portion of striped pink for navigation. Scrolling down, a slider can be seen. This can be maximized for featured products, events, announcements, and even discounts. Basically, this should be used for something to attract more visitors. Right below the slider, you can see additional links for the shop, the blog, and other information. There is also a sign-up form for the newsletter. This is followed by blog posts that is good if the owner wants to also communicate with her visitors for more updates and announcements that visitors might get excited about. 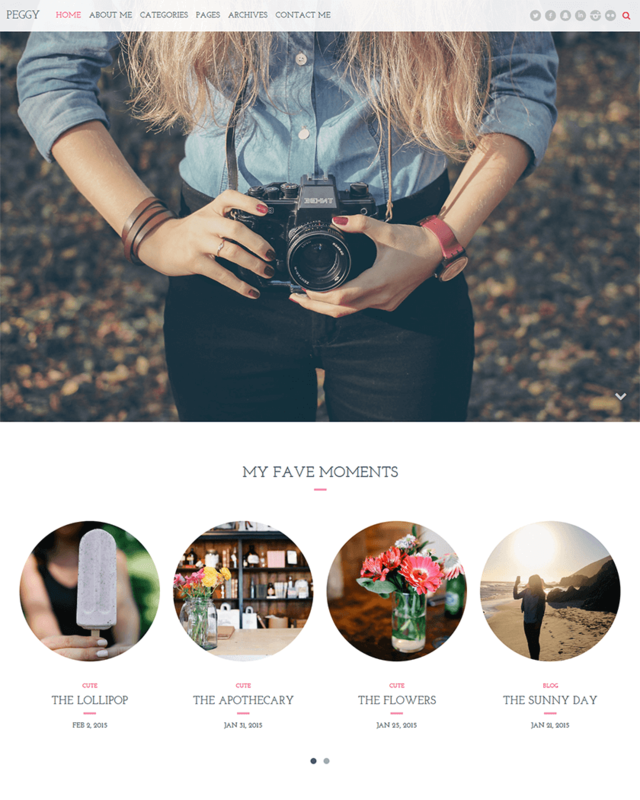 Kloe is a beautiful feminine and girly WordPress theme. It is highly customizable as well, perfect for those who know exactly what they want from their theme. It usually opens up with a full width background that looks really good if the photo put there, is high resolution. Below this background is the website content. The user can choose among several layouts for their website content. For instance, they can choose the original layout, the masonry shop layout, the shop home layout, the modelling agency layout, the blog centered layout, the blog with sidebar, or the portfolio masonry. What makes Kloe modern is the parallax showcase which makes the animation when scrolling down look visually stunning. Kloe’s default style is minimalist in its chosen colors, using only gray, black, white, and a hint of pink. Kloe is perfect for catalogue and portfolio uses as the design of Kloe is interactive. Josephine is a good Lifestyle blog with a touch of femininity. It’s actually good for an online magazine or for a group who just want to start a blog. This theme’s layout is actually pretty simple, compared to some of the modern designs out there. It starts with the website title and subtitle. Below website title is a collage of thumbnails of photos and their corresponding posts. This is where featured posts can be highlighted, which is good if you have an advertorial or if you have new posts you want featured. Below the featured posts is the website content itself. Although there many layouts available, the default layout is a two-column layout that has the entries and the widgets area. If you don’t want to clutter your sidebar with widgets, you still have space at the footer for more widgets. You can put an About Us there or social media links, whichever you prefer. 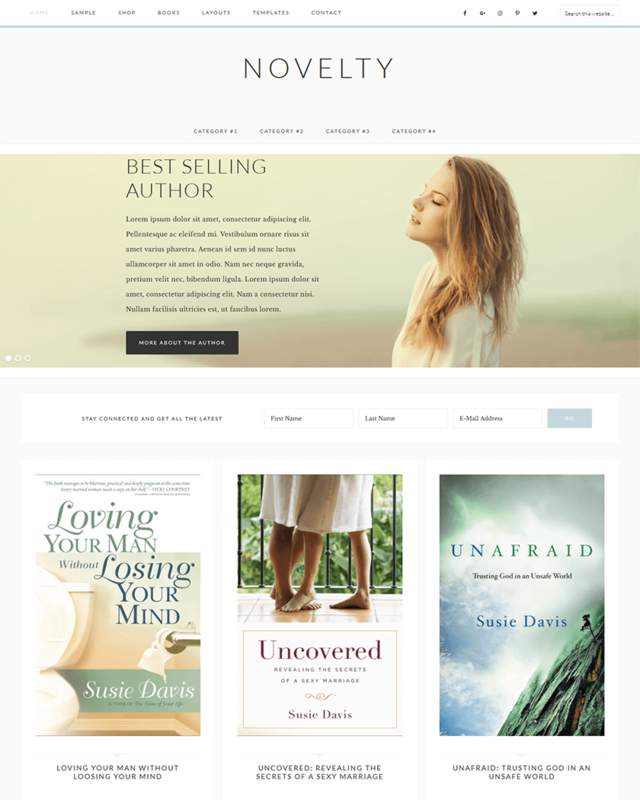 Zarja is a feminine WordPress theme designed for personal blogging. It is specifically designed to have feminine features. In fact, Zarja has a “manly” counterpart called Brixton. Zarja has several layouts, but in all layouts, the website will welcome you with a thin header with navigation links and then the logo or website name. Zarja’s feminine touches can be seen in its lavender floral patterns on the side, on top of an all-white background. As mentioned, this theme has several layouts: the default layout has a slide below the website logo. The other version has a sidebar, while another version features a full-width layout. 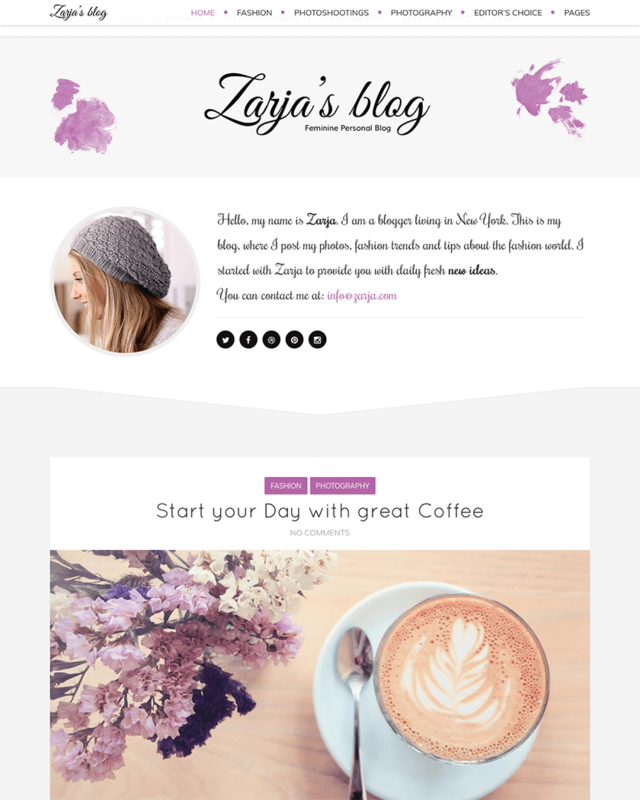 Unlike other feminine WordPress themes, Zarja makes use of purple/lavender accents instead of the usual pink tones. However, just like its variety of layouts, the colors can be changed. You are not limited to the purple tones of the website, and you can definitely use your favorite color as accents. Chic really lives up to its name. 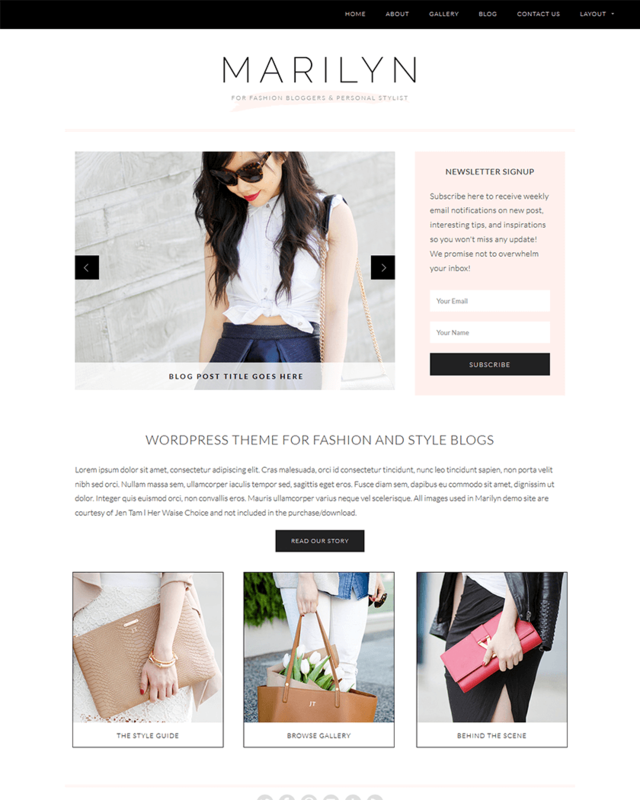 It is a feminine, modern, and sleek WordPress theme fit for lifestyle and fashion websites. Chic is very flexible. For instance, you can use it only as a lifestyle and fashion magazine or blog or make it an e-commerce store where you sell fashion and lifestyle products. But what happens if you want to have both? Chic can totally accommodate that, too. Chic is two-toned. The thin header is white with navigational links and social media links. Right after that is the gray palette of the background. It has a slider where featured posts or products can be placed. After the slider, 750x90 advertisement slot can be placed, and this is perfect for products that you want to be sold. Below that is the actual website content, with a sidebar at the right. The sidebar may contain additional ads, a search bar, your Instagram account and a sign-up form for your newsletter. 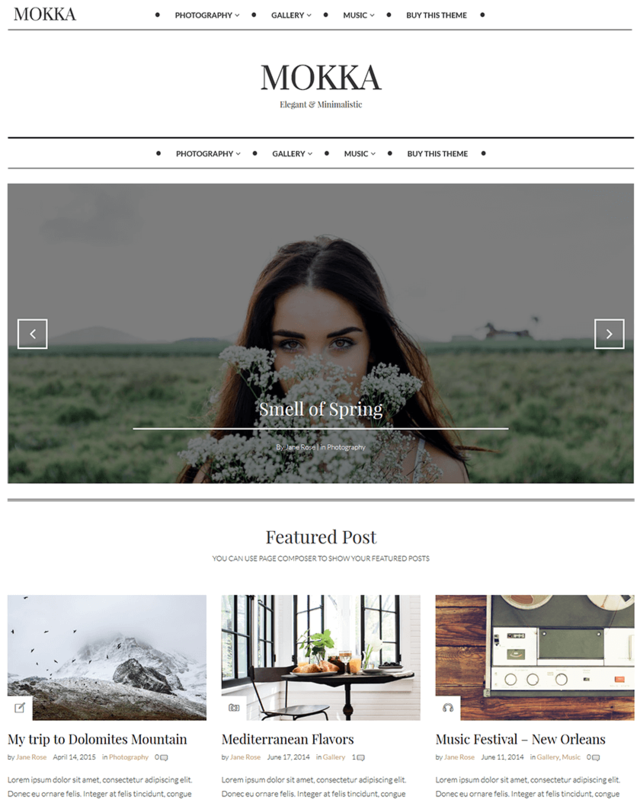 Mokka is an elegant and modern WordPress theme. It is not particularly very feminine, but women may definitely appreciate the design. It’s a very simple design and yet it looks beautifully crafted. Mokka uses white as its main color. It has a thin header where the menu can be seen. Right below it is the logo or website name. What follows the logo is the categories for additional navigational help. This theme features a full width slider that looks really beautiful with its white accents. Below it, you can see featured posts in a grid. It stretches out from one side of the screen to the other side, accommodating three featured posts. After that, you see the two-column layout of the website content. On your left, you can see the latest posts with a photo and excerpt. On your right is a sidebar where you can place a short description about yourself and other important widgets. Adorn definitely puts girly in a whole new level. It is specific to those who want feminine touches in their website. 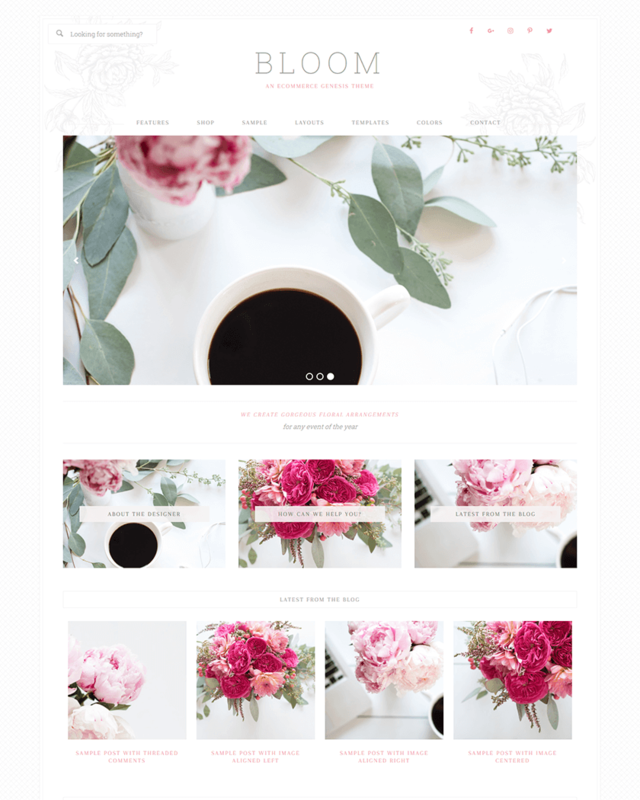 Unlike other feminine WordPress themes who try to put feminine touches by adding floral designs and touches of pink, Adorn does it differently. The entire background of Adorn is a gentle light pink. The interface of Adorn is also very compact. It starts with the logo or the website name, and just below it, are navigational links in light gray. Below the navigational links, you can see a two-column layout that looks different from the other themes. 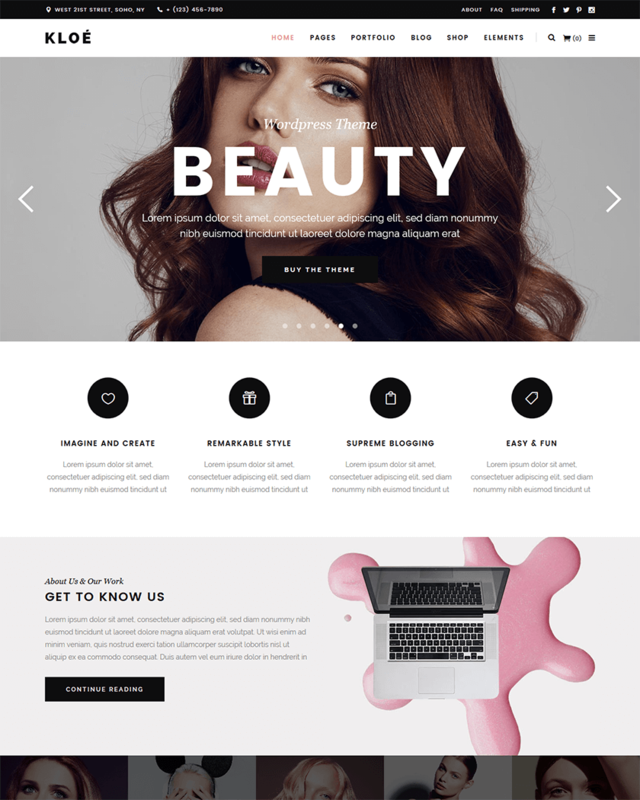 Bloom is an eCommerce WordPress theme that has elegant touches of femininity. Unlike the plain background of other feminine WordPress theme, Bloom has a subtle gray floral and checkered design. The accents on Bloom are a nice light pink. Upon opening a website that uses Bloom, you will see a search bar at the top left corner and social media links on the top right. Just a bit below it, you can see the logo or website title right smack in the middle. Underneath the website title, you will see navigational links. Following the links is a big slider where you can put product shots. Below the slider, more links to different pages of the website are placed. These are displayed as photos with texts on them, and they are placed in a grid like manner. Scrolling down, you can see recent posts from the blog, which is your website content. They follow the same layout as the links above them. There is a portion at the bottom where new products can be featured. At the footer, you can place additional navigation links, social media links, and a sign-up form for the newsletter. Created by the same developers of Bloom and other feminine WordPress themes, Novelty is for those who prefer a more minimalist and neutral-colored website. Of course, accents and colors of Novelty can be changed, but the default layout looks neutral. It has a header at the very top where navigational links can be seen as well as a search box and social media links. Below it is the website title, and underneath the website title, categories can be seen. Novelty has a slider, too, but it is full width in size, unlike Bloom’s. This is where featured posts can be placed. Under the slider, you can already put a sign-up form for the newsletter there. This is followed by the website content which is displayed in photos. Also, developed to be an e-commerce website, Novelty allows this portion to be the products to be sold. Under each product, link to more descriptions of them can be seen. At the very bottom, navigational links can be placed as well, and they are also displayed as photos. If you want more categories, they can be placed below these additional navigational links. 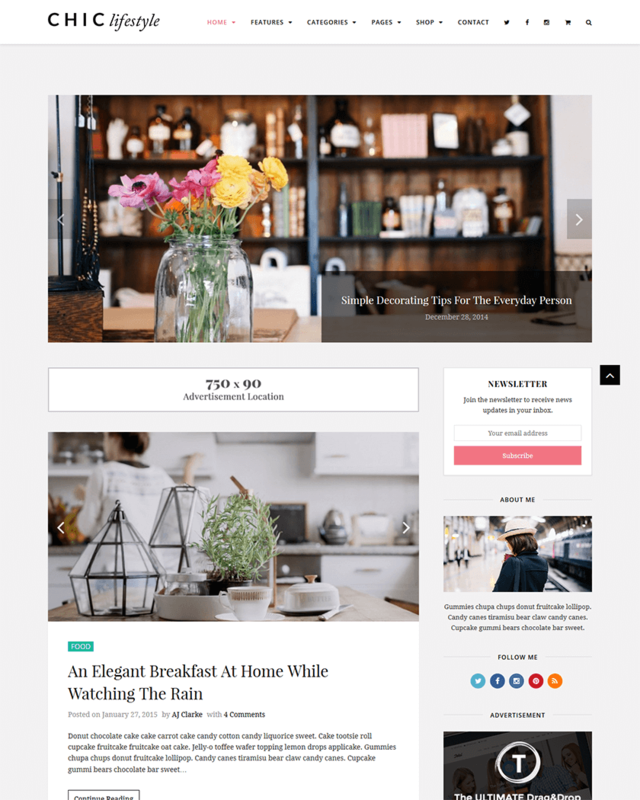 Peggy is a clean responsive WordPress blogging theme perfect for mommy blogs, female bloggers, beauty and fashion blogs or any other type of blog. The theme has been used only the best pixels to designed into a modern and great looking theme for bloggers. The homepage sticky content in a simple carousel – even switch from circles designs to squares for sticky as well as related content through theme customizer, also above that you have a beautiful large image with text message. The widgetized sidebar, header and footer allows you to quickly change its layout, as well as add new elements easily.